The 30 sqm rooms are a mixture of modern and tropical design, with an ambience that is exclusive and stylish. Most room features its own small balcony overlooking the garden ensuring its solitude, intended as a peaceful retreat. 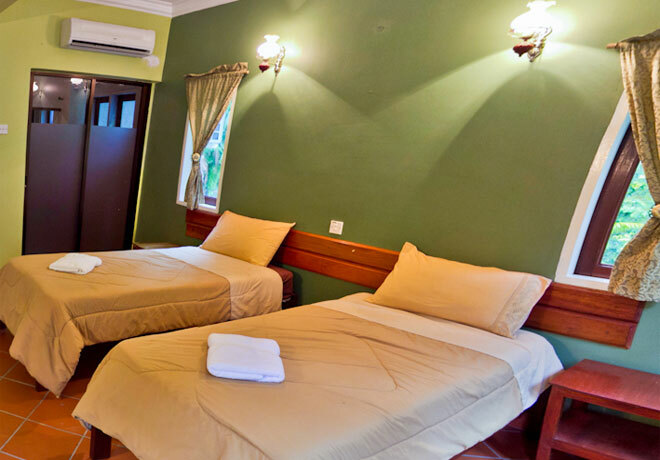 Its room consist of 2 single beds are suitable for those traveller who wants comfort and privacy. The ship-shaped swimming pool with Jacuzzi is a prominent feature that can be enjoy when staying at Anjungan Beach Resort. The pool exudes an exclusive appeal for one to relax or just simply basked in the tropical sun. Room Facilities : Mini-bar, Hot Shower, LED TV, Air Conditioning, Satellite Channels, Bathroom, Complimentary Wi-Fi, In-room Safe, Hairdryer, Small Balcony, Coffee and tea-making facilities. Rates are nett. Inclusive of 6 % GST TAX. The above are nett rates inclusive of 6% government tax and 5% service charge. The rates are subjected to change without prior notice. Number of rooms allocated are based on availability. As we have rooms to cater for different categories, the resort has a strict policy on the number of pax occupying rooms. Kindly make bookings accordingly. We offer a variety of amenities for your convenience. Click the following button for details. In order for us to reserve the room for you, please: Call us first before Crediting 50% (Weekdays or Weekends Rate)/100% (School Holiday or Public Holiday Period Rates) to ‘ANJUNGAN BEACH RESORT AND SPA SDN. BHD.’ MAYBANK A/C NO: 5581-6380-3776 to ensure the availability of the room and subsequently, please fax the payment . The balance to be paid upon check in. Confirmation is done via online voucher, for online booking. Email or phone confirmation booking is done for telephone or email booking. Less than 8 days from check-in date 50% of the total amount is chargeble. Less than 4 days from check-in date 100% of the total amount is chargeble. NO SHOW - 100% of the total amount is chargeble. Free! All children under 5 years stay free of charge when using existing bedding. There is no extra beds or mattresses provided or allowed. Your reservation is absolutely secure. All personal data is encrypted and will be processed in a secure way. We take the privacy of your personal data very seriously. Connecting rooms are subject to availability. Room are based on the number of people. Once the booking has been made, the terms and conditions and cancellation policy applied. The resort reserves the right to cancel the booking if the number of guests is more than the number stated in the confirmation form.